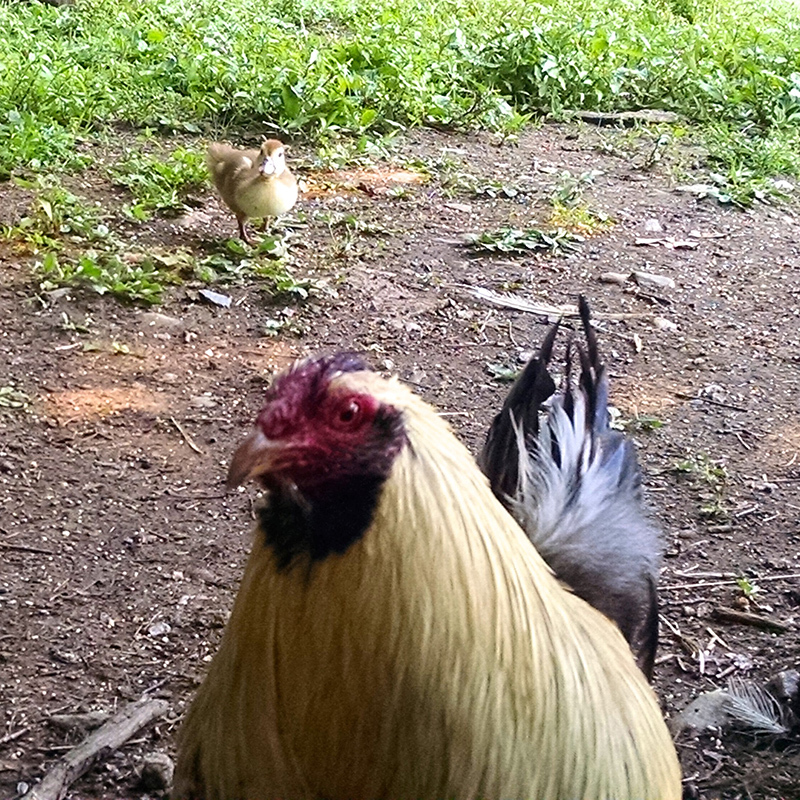 Sharkey came to VINE Sanctuary as one of a group of roosters seized by authorities from a cockfighting ring. 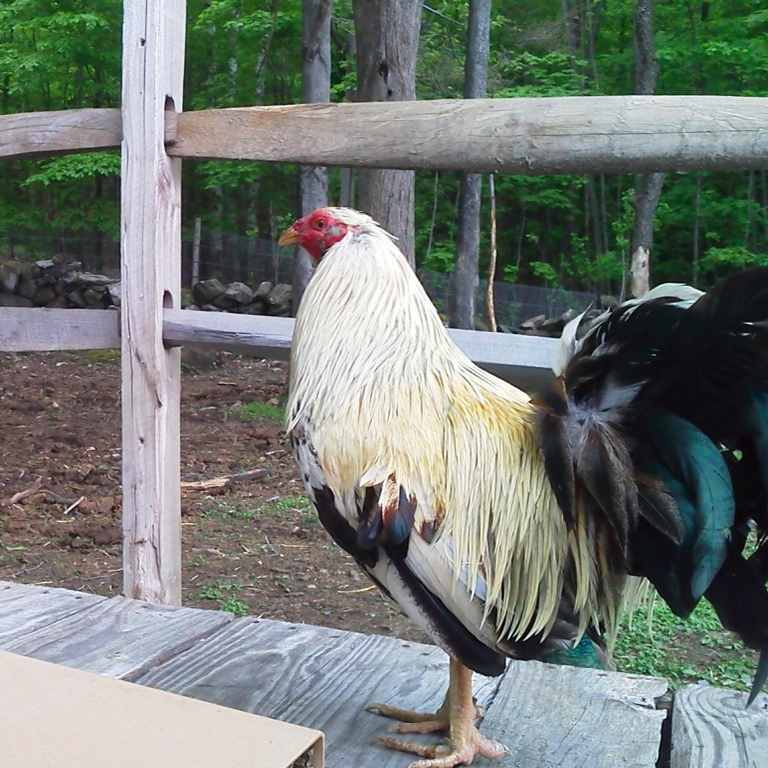 While roosters who have been used in cockfighting do have to learn not to attack other birds, most do not object to being handled by people. There are always exceptions to this rule, however. Every group of rescued roosters includes one or two birds who are so hyper-reactive –so terrified— that they fly at people too. In this group, that was the red rooster we call “Bitey Bitington” and Sharkey, so named for the gashes he opened up on the arms and legs of sanctuary staff. Sharkey’s cage happened to be in a grove of beech trees adjacent to Pattrice’s Airstream trailer. In warm weather, pattrice likes to work outside. Other sanctuary staff often stop by to chat. Right away, we noticed that Sharkey was joining in our conversations, clucking whenever we laughed and adding his two cents whenever our voices became particularly animated. During the rehabilitation process, former fighters are allowed out of their cages twice or more each day, remaining at liberty until they start a fight. Some make clear that they would prefer not to fight, actively steering clear of potential conflicts by going off on their own. Others go looking for trouble. 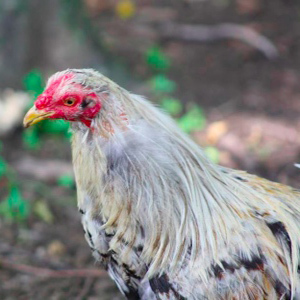 Over a period of time that can range from a few days to several weeks, the time between fights lengthens until the rooster has demonstrated that he can be trusted to either socialize within the flock or go off on his own without being supervised. At that point, he is considered rehabilitated. Sharkey got into his share of tussles but, for the most part, turned out to be a bird who preferred to avoid conflict. During his increasingly long free periods, he preferred to hang out with Pattrice, soon appropriating her work table as his living room. He made friends with sheep and developed a taste for coffee with soy creamer. Soon, Sharkey was able to safely be free all day long. The only things he didn’t like were going into a coop to sleep at night and then making his way back to the Airstream each morning. 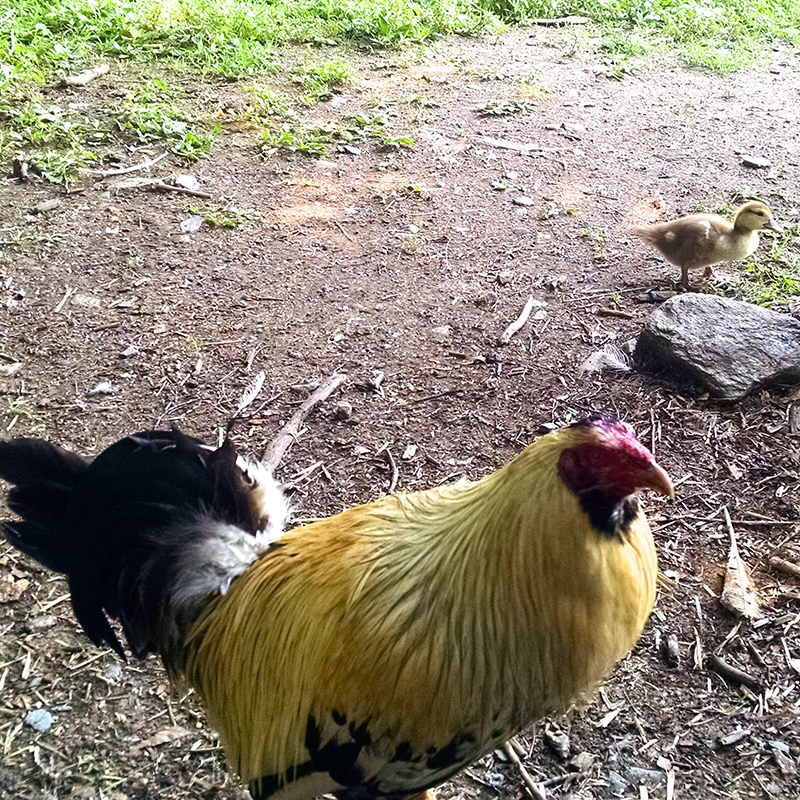 While he got along well with the roosters who hung out near the trailer, the large and raucous groups in each of the coops made him nervous. 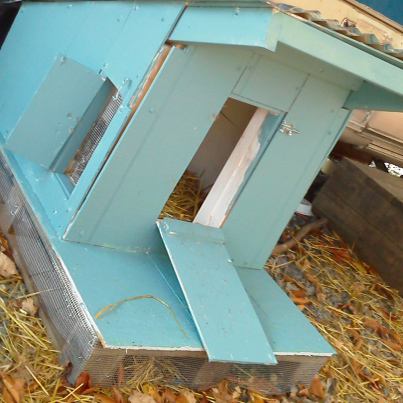 Cheryl came to the rescue, cobbling together a stand-alone “apartment” for Sharkey out of scrap wood and setting it right beside Pattrice’s steps. Kathy supplied a dash of paint, and Sharkey became a proud home-owner. When Sharkey arrived at the sanctuary in the summer of 2013, bare skin showed through patches of missing feathers, especially on his head and around his neck, giving him a raggedy, scruffy look. He has since regrown his feathers and turns out to be a particularly striking bird. As of this writing (early spring of 2014), Sharkey spends his days in an area that stretches from the pigeon aviary to the hay rings and includes his beloved Airstream, under which he often takes shelter and into which he sometimes steps in search of cat food. 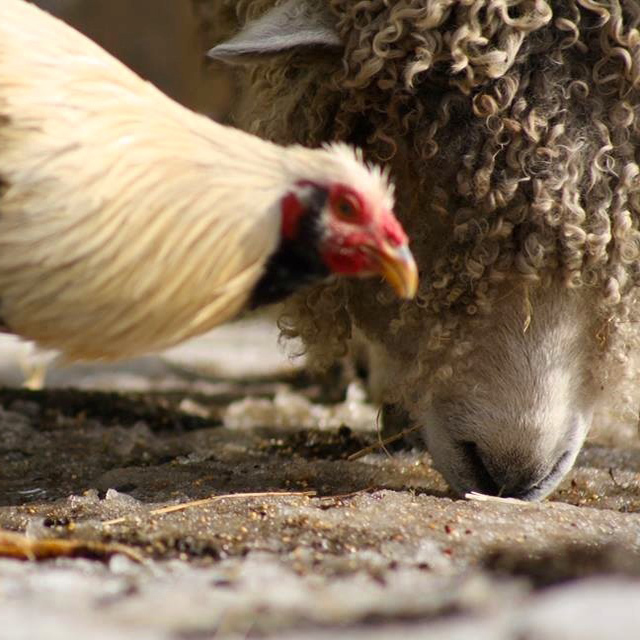 He often forages along with sheep Nigel, Lemon, and Olive and is friendly with roosters Scarlet and Matisse. 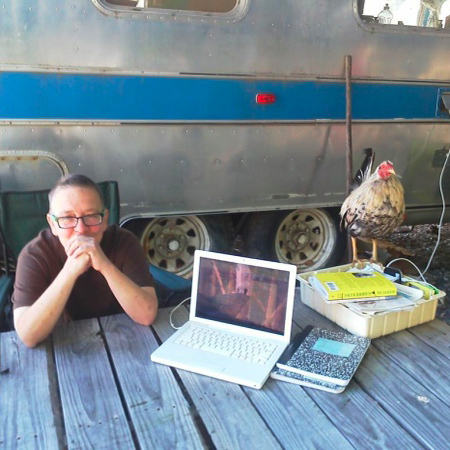 Soon it will be warm enough to resurrect the outdoor work table, and then he will be able to help Pattrice with her writing again. And the other biter? 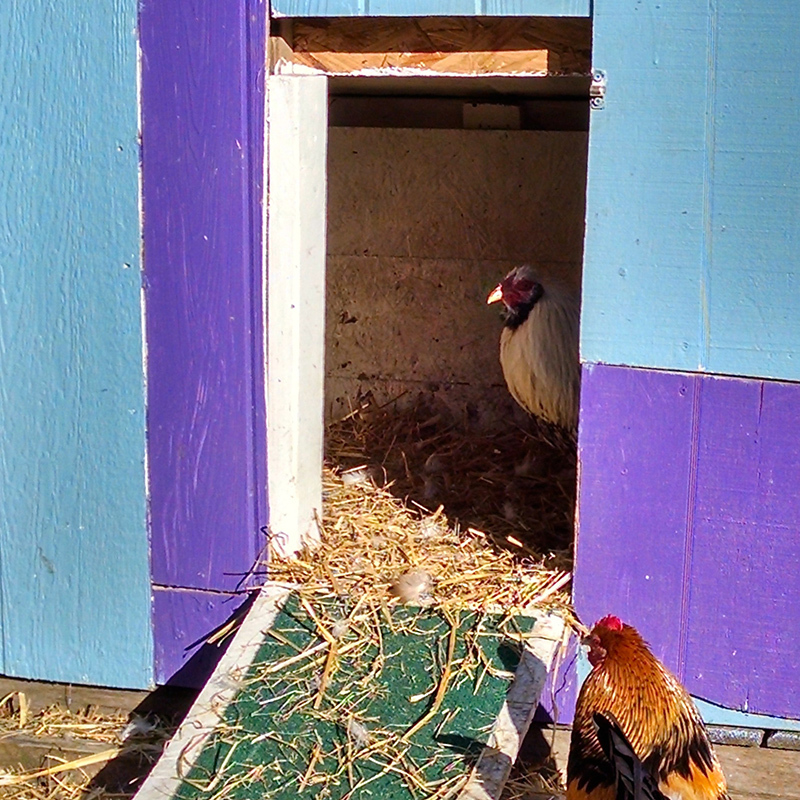 Bitey Bitington now lives peacefully, along with former fighter Bennett and a turkey called Unka, in “Wayne’s World”—a coop and yard otherwise dedicated to hens and roosters rescued from Kapporot (or Kaporos) rituals each year. VINE Sanctuary provides a haven for animals who have escaped or been rescued from the meat, dairy and egg industries or other abusive circumstances, such as cockfights or pigeon-shoots. 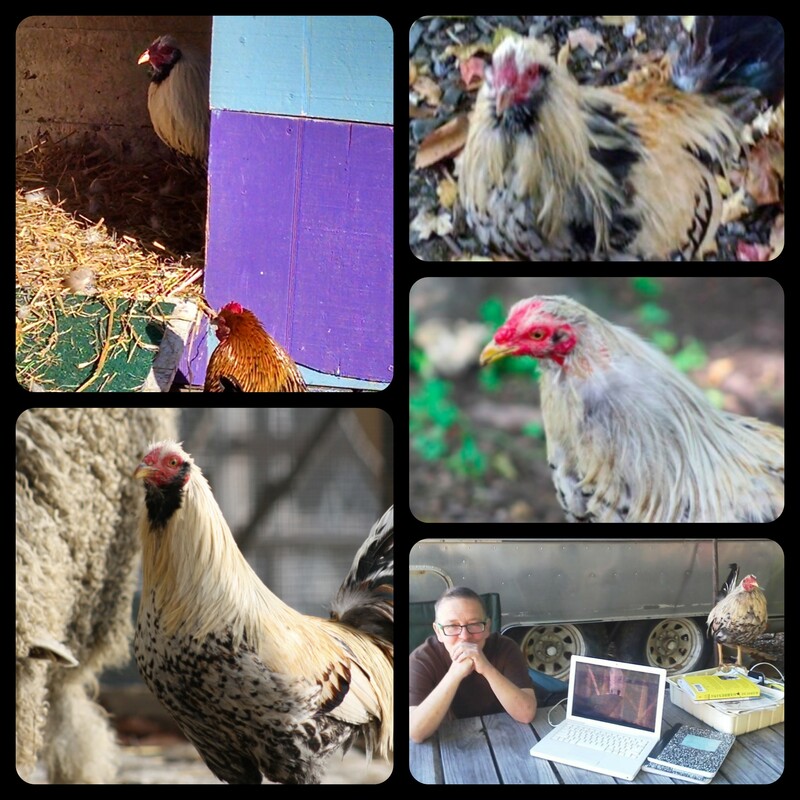 Sanctuary residents include chickens, cows, ducks, doves, geese, pigeons, sheep, emus, and even a few parakeets. In addition to sheltering and advocating for animals, we conduct research and education aimed at creating systemic changes in agriculture, trade, and consumption as well as human attitudes about animals and the environment. We work within an ecofeminist understanding of the interconnection of all life and the intersection of all forms of oppression. Thus we welcome and work to facilitate alliances among animal, environmental, and social justice activists.